I first saw this wonderful bread on Dolce Vita, David Rocco’s cooking show. It is naturally gluten and dairy free and so easy to make. I really like this bread with a salad, a meal, or as a meal on it’s own when I’m traveling. If you are looking for something that is also budget friendly, well this is the deal. A bag of chickpea flour is a little over a pound and costs around $3-4. It’s a great deal and can be the centerpiece of your meal. My oldest who is a vegetarian, likes to toast this bread and top it with Buffalo Wing sauce. He’s very creative that way. David says that La Cecina is very common in Italy. I hope to go there sometime just to see if that is really true. I followed David’s recipe the first few times I made this bread, but you know me. I like to experiment and change up seasonings so this recipe is a little different, but not much. I asked David on Facebook if he ever made this with rosemary or garlic. He said no but it sounded good. So I gave it a try. I hope you will too. Mix together everything in a large bowl except only mix in 2 TB of the oil. Make sure you get rid of all lumps in the mixture. Let this rest for 1 hour. Put the remaining olive oil into your 14 inch pizza pan. Pour the batter into the pan slowly so it floats in the oil. Put into a 450 degree oven and bake until golden brown, 30-40 minutes. I slice it up like a pizza but you can cut it any way you like. I usually will eat this warm right out of the oven but it does taste good cold. This was shared on Slightly Indulgent Tuesdays. Oh man – I so have to try this, and soon. I'm thinking bread and soup on the next blustery fall day! We're already out so I'm making more for dinner tonight. May try the rosemary. Let me know if you use the garlic and onion or leave it out. Deanna- oh I don't like the thought of a blustery fall day. I'm hoping for some really nice still warm but not hot fall days. 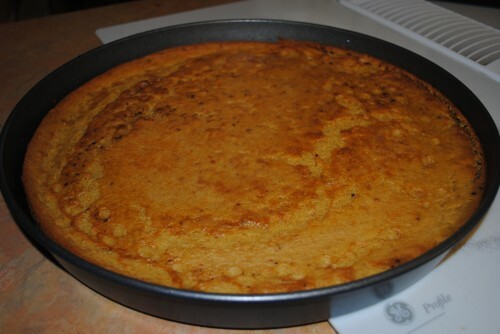 This is really similar to the socca I make but I use a 1 to 1 liquid to flour ratio for it. I think your ratio uses more like a 2 to 3 ratio. Still, I know without even tasting it that it's fabulous. I love bean flours – they are so versatile. You can use them in the pure form like you do here and get a rich flavor or they can be mixed with other flours and you never know they're there. Can't wait to try this, Diane. 🙂 Thanks for linking up. I am going to be on the lookout for more ideas using non-grain flours. My body seems to like them a lot more. Happy to share this one. Make sure you have a big enough pan so it spreads out. It will be a different texture than regular bread. But yes, I do love the flavor. Hmmm. I'm having the same problem. I'm using a 14" pan though. The consistency is like mashed potatoes. Is that right? Tastes good though. Vanessa, when you talk about the consistency are you talking when you pour it into the pan or after it's cooked? Make sure you are adding enough water. So I was talking about the consistency of the finished product. It never seemed to get past a "mashed potato" stage. However, once it cooled it firmed up! So really I probably overcooked it when I just needed to let it cool a little. Does that sound right? This looks great!! Do you know about how many cups of flour you use for the lb of the flour? I know it varies by flour type. Unfortunately I do not have a scale. Vanessa I've not measured it that way. The bag of chickpea flour I use is 1 pound 6 ounces so it's almost a full bag. Grab yourself a kitchen scale. They cost around $15 and are great for baking. Got myself a scale and am ready to go!! So here is one more question… how do you toast the garlic and onion? Vanessa I used dried toasted garlic and onion from Penzeys Spices. You can always cook without it or use the spices you have. When I was traveling in Italy I was in Pisa and decided to take a trip for dinner. We went to the small town of Lucca. We found this cute hole in the wall plae that served Cecina. It was amazing! Then I saw the recipe on David Rocco’s show. Now I’m definetly going to try and make it at home! We love this recipe!! Been making it for a while now. However, now I can't eat onion or garlic…bummer! What other spices have you tried, if any. Thanks!! Vanessa think of this as almost a blank canvass. You can use whatever spice profiles you are interested in. Indian spice combos would work, I do live rosemary too. Sun dried tomatoes are good too. Go to a good spice store like Penzeys or get on their website and poke around for ideas. Think about your favorite meals and the flavors you like. Let me know if you come up with a new combo!